Enable, disable, restart, load, reload, and unload plugins from in-game or console. List plugins alphabetically, with version if specified. Get useful information on plugins such as commands, version, author(s), etc. Easily manage plugins without having to constantly restart your server. List commands a plugin has registered. Find which plugin a command is registered to. Tab completion for command names and plugin names. Dump plugin list with versions to a file. Permissions Support - All commands default to OP. /plugman help Show help information. /plugman list [-v] List plugins in alphabetical order. Use "-v" to include versions. /plugman info [plugin] Displays information about a plugin. /plugman dump Dumps plugin list and versions to a file. 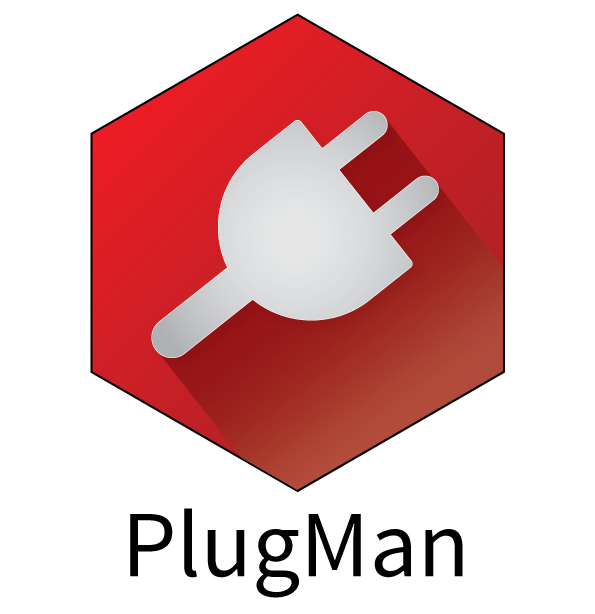 /plugman usage [plugin] List commands that a plugin has registered. /plugman lookup [command] Find which plugin a command is registered to. /plugman enable [plugin|all] Enable a plugin. /plugman disable [plugin|all] Disable a plugin. /plugman restart [plugin|all] Restart (disable/enable) a plugin. /plugman load [plugin] Load a plugin. /plugman reload [plugin|all] Reload (unload/load) a plugin. /plugman unload [plugin] Unload a plugin. /plugman check [plugin|all] [-f] Check if a plugin is up-to-date. plugman.admin OP Allow use of all PlugMan commands. plugman.update OP Allow user to see update messages. plugman.help OP Allow use of the help command. plugman.list OP Allow use of the list command. plugman.info OP Allow use of the info command. plugman.dump OP Allow use of the dump command. plugman.usage OP Allow use of the usage command. plugman.lookup OP Allow use of the lookup command. plugman.enable OP Allow use of the enable command. plugman.enable.all OP Allow use of the enable all command. plugman.disable OP Allow use of the disable command. plugman.disable.all OP Allow use of the disable all command. plugman.restart OP Allow use of the restart command. plugman.restart.all OP Allow use of the restart all command. plugman.load OP Allow use of the load command. plugman.reload OP Allow use of the reload command. plugman.reload.all OP Allow use of the reload all command. plugman.unload OP Allow use of the unload command. plugman.check OP Allow use of the check command. plugman.check.all OP Allow use of the check all comamnd. PlugMan is open source and hosted on GitHub; feel free to fork, star, or contribute to PlugMan by making pull requests and opening issues. To view those who enable this project to be developed, please refer to the GitHub page. Samkio has made a tutorial showing the basic usage of the plugin. PlugMan requires (at least) Java 7 to run. If you have an error, please use a paste service (such as http://hastebin.com/) instead of the comment box. Still works great on 1.13.2. I use it constantly. Thank you for this amazing plugin. Is there a working version for 1.7.10? yes !!! very good !!! yeah! i updated and its awesome! Apologies for the delay - I've been travelling for the past 2 months. The latest version from my Jenkins has the auto-updater removed, please give it a try and let me know how it works. Huh, not sure how but somehow plugman "autoupdated" (downgraded) to the beta version (1.8.1) a week or so ago. Same thing happened to me but in my case it corrupted itself when it tried autoupdating. I changed the update-type to "check" so hopefully it doesn't happen again. I'm gonna guess curse screwed something up temporarily, since it seems like there's no activity here. I took a quick look at the repo and it seems Plugman's auto-updater is currently broken and reverting a lot of people to an older version or corrupting the .jar. Looks like they'll be removing the auto-updater. Hmm interesting. Idk what's going on with the Updater branch but that's... interesting. Can't be bothered to investigate what's going on myself, I'll just use lucko's fork. But feel free to let me know what the issue is/was caused by if you or anyone else finds out. By default the plugin should only give access to people with permission, so I would configure your permissions system better. Also, if you OP your admins, I wouldn't do that - just give them the permissions they need. Minecraft/spigot doesn't designate anybody as the 'owner' - but a permissions system easily could! Now is a good time to learn what and how to backup, and to do so now. Hello. This plugin has been a wonderful addition to my server, extremely useful!